A big surprise revealed itself earlier this month, when I received a call from Kecap Bango, about their upcoming event. 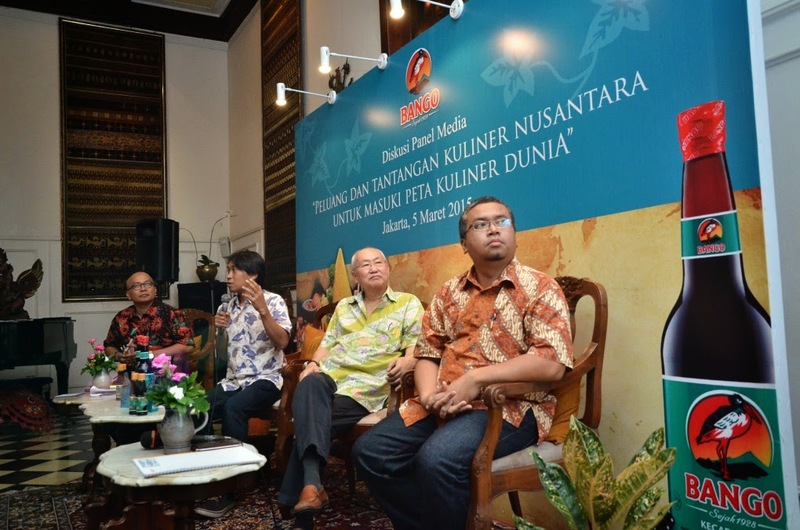 Turned out Bango was planning to create a Media Discussion Panel titled "Peluang dan Tantangan Kuliner Nusantara Untuk Masuki Peta Kuliner Dunia" (Opportunities and Challenges for Nusantara Culinary to enter World Culinary Map) in Jakarta. While it sounds interesting, just like with other event invitation happening in Jakarta, I was ready to say thanks but no and proceed with the regular reason that I'm living in Bali so traveling will be an issie, et cetera. To my surprise, they're inviting me to join the event as one of the panellist instead! Upon further conversation it was revealed that I will be presenting the topic in relation with the digital channel, as I'm a food blogger. By doing so, I will be sharing the stage with the renowned Indonesian food ambassador Om William Wongso, and historian JJ Rizal. The event itself is going to be hosted by Kang Maman who does magic with his Notulen. Since I think it's a great chance to boost forward my interest in food blogging, and getting acquainted with the creative minds, so I said yes. Despite the chills, and the piling up to-dos on my desk at the office. So, on the D-Day there I were, entering Oasis Restaurant for the first time. I was in awe by the old school atmosphere charm it emit, which is quite consistent with the restaurant reputation as "The Rijsttafel restaurant. It's like entering the socialite club like Concordia Society in Braga, Bandung, during the Dutch occupancy era, but I can only guess. Meeting the organizers I was again briefed about how the event will proceed, and then met the other panelists when they arrived, discussing about how we would realistically proceed. Judging on the quite intense discussion with Om William Wongso, I'm really excited to hear more during the panel discussion. After a round-table lunch with all the panelists and representatives, the panel begun with opening speech from pak Achyaruddin, MICE Director of the Indonesia's Kemenparekraf. Pak Achyar outlined the effort that Kemenparekraf has take, including the announcement of 30 Ikon Kuliner Tradisional Indonesia (IKTI), the controversy behind it, the challenges he's facing from both inside and outside the department, and what is the government stance at the moment. Starting the discussion, JJ Rizal first brought the topic of early Indonesian culinary history, with intriguing question "How come Indonesia doesn't have its culinary history written?" then followed it with some examples of Indonesian culinary records reaching back to the times when Ramayana was written by Empu Walmiki. There were mentions about the type of food for the commons, and food for the nobles. Interestingly, those that getting preserved is the first one, while the later got lost in time thus only records of their names remains. JJ Rizal later also introduced two books that he believes are the most complete Indonesian cook book that's ever written, one of it was Oost-Indisch kookboek which was written by Dutch author JMJ Catenius-van der Meijden, and consisting of 1,381 Indonesian food recipes. 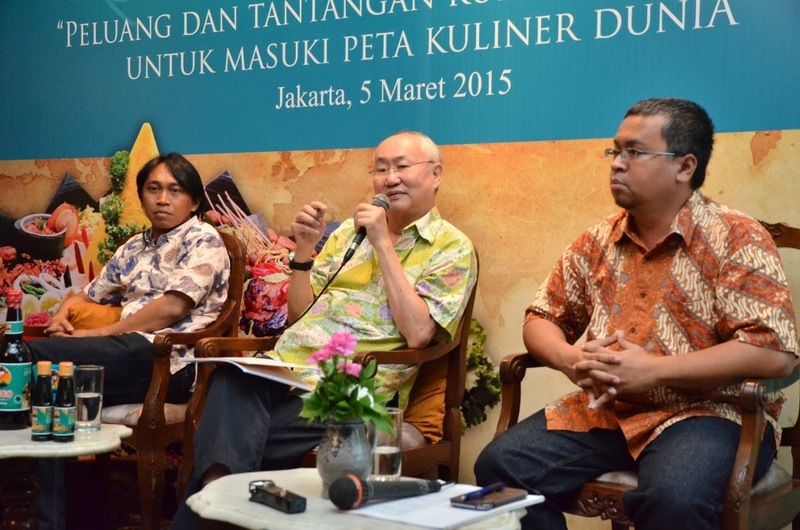 The other book was Mustika Rasa which written and published by Indonesia's Department of Agriculture 47 years ago. It was created under mandate of the late President Soekarno and took 7 years to complete. The book itself is 1,123 pages thick and consisting of 1,600 recipes from all over the country. 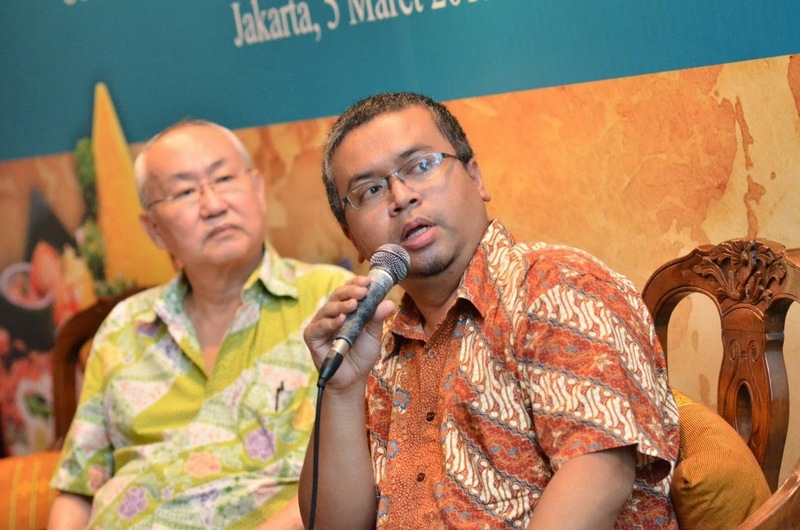 The main intention itself is to anticipate the food crisis, by educating Indonesians that there are a lot of food alternative existed, in their own regions. Om William then proceed with sharing his knowledge of Indonesian food's current situation in the world, how we're still far behind other leading Asian countries like Thailand, Vietnam, Korea, and Japan, yet so little effort has been done by the Indonesian government to catch up with those countries. Internally, it was revealed that even our Presidential Palace are still happy with serving visiting country leaders, an international menu set which comprises like steaks and so on, instead on insisting them to try the beauty of Indonesian food. Furthermore there is also a confusion in our cooking industry, into thinking that we should tame down, or even alter our food taste to suit "the western taste" hence authentic Indonesian food is a rare thing to find outside Indonesia. 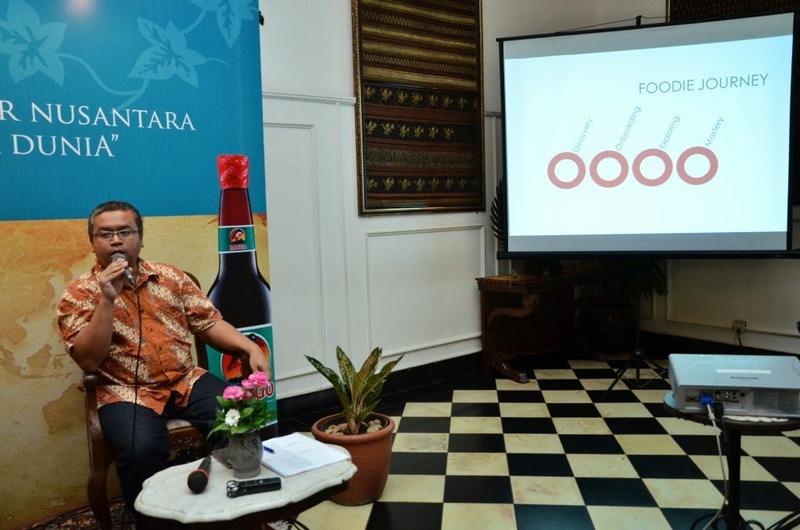 As with the food reproduction aboard, Om William also noted that today Indonesian food are still a hassle to recreate, due to the lack of proper seasoning ingredients. Unlike Thai chefs that's already have plenty of materials supplied by their country's industries, so in the word of Om William, it's like they're "a painter with all the paint provided", while Indonesian chefs are still struggling with preparing their dishes, sometimes from zero. Substitution sometimes work, especially when there's Thai community or Asian community in the neighbourhood, as we tend to use similar ingredients, but care must be taken to ensure a correct output. For example, while Rendang Padang might still be created using Thai's coconut milk, we need to double the amount and prolong the cooking time as Thai's coconut milk tend to be lighter than Indonesia's. 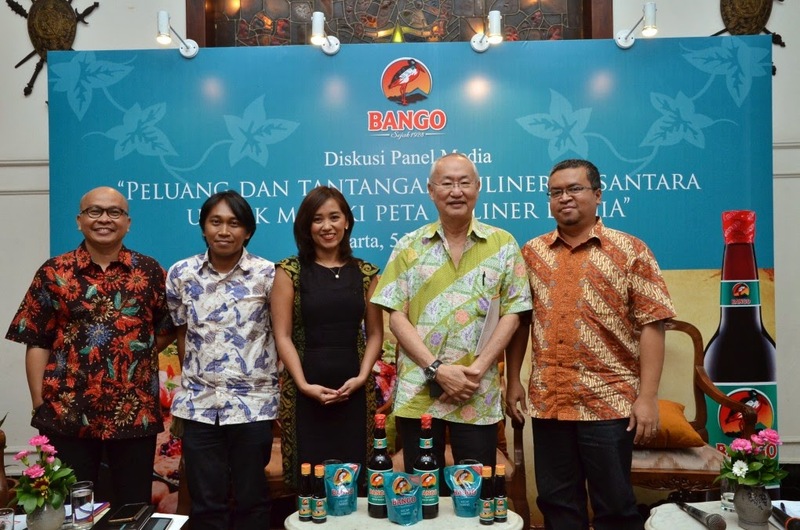 Om William also raise the request for Indonesian industries like Kecap Bango to expand their export to the western countries, not to be shy, as it would help Indonesian cooks to recreate Indonesian cuisine correctly, as authentic as possible. It was an interesting talk and I could sit there listening to his talk for hours, so many insight and opportunities. Last, it's my turn to introduce the audience into "The Foodie Journey"
Borrowing the perspective from Customer Experience Design, I wrapped my presentation in a stages of "The Foodie Journey" that someone would take, starting from a complete stranger, into becoming the prominent promoter of Indonesian Cuisine. The first part of that journey is the Discovery stage, and this is where someone becomes aware about the existence of Indonesian cuisine, and usually it's done with the help of the mass media, in form of articles or coverage. This is a very important stage of the foodie journey as you can't grow to like or love something unless you know that thing exist. Words of mouth is also a good source of introduction into Indonesian food, and in today's internet connected world, this is where the food bloggers, and foodies take part by actively spreading the Indonesian good food scene to the world. Read the full disclosure of The Foodie Journey here. At the moment, sadly Indonesia is currently losing, even in this earliest stage: Discovery. 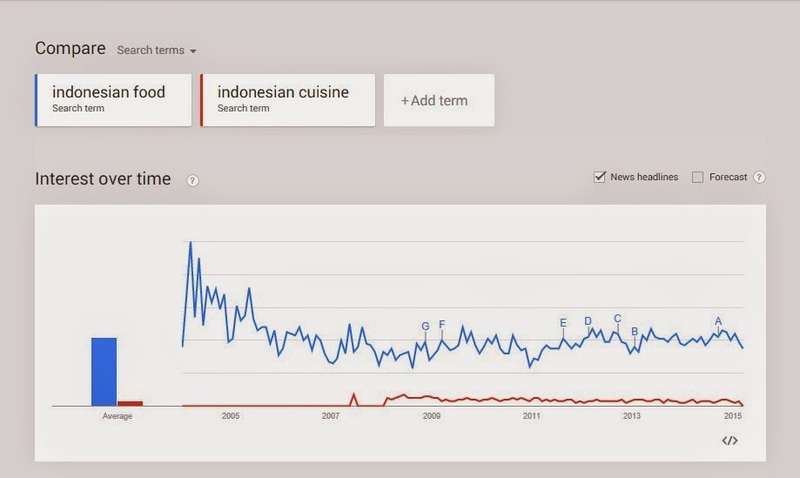 On the internet, a Google Trends research produce an alarming rate of the decreasing popularity for Indonesian cuisine. 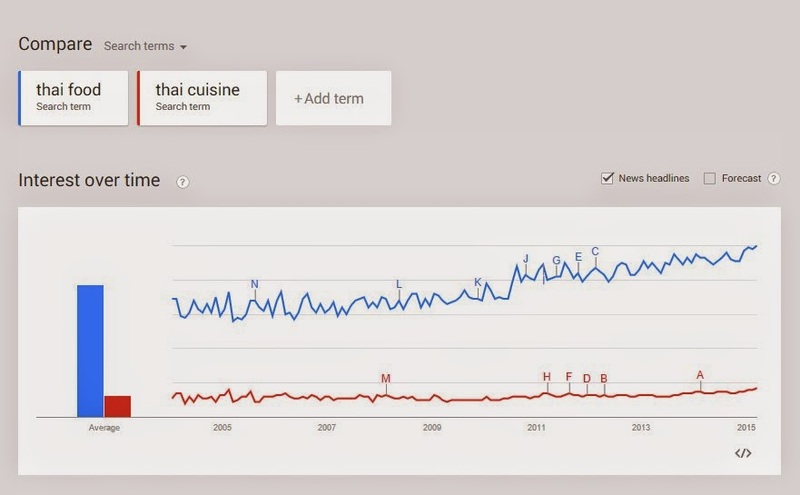 Popularity of Thai Cuisine over the internet. 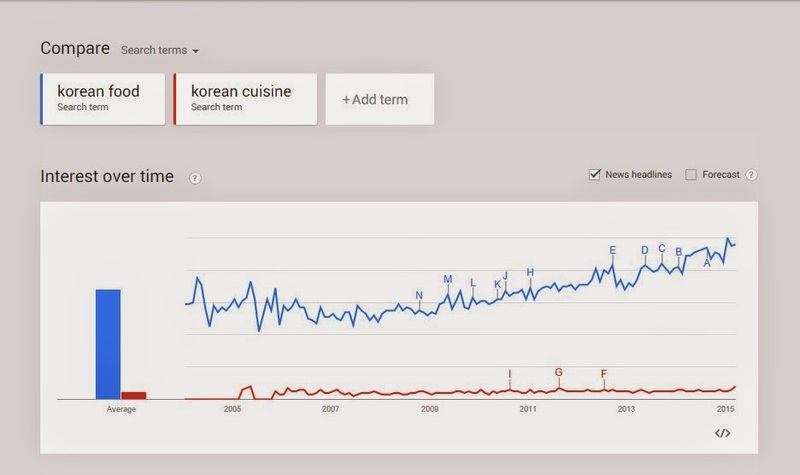 Popularity of Korean Cuisine over the internet. Indonesia have a lot of food bloggers, English speaking ones, which means they can compete head to head with the neighbouring countries' food bloggers. Food bloggers and foodies also practically acts as promoters of Indonesian food to the world, which in turn help educating the international society on what Indonesian cuisine is, and what are the good food available in Indonesia. We can help raising international awareness and interest in Indonesian Cuisine, as well as luring people to visit Indonesia and samples its delicious food. Closing note: One of the necessary skill for a panellist I believe, is to be able to connect with other speaker's talk, find interesting keynotes, then generate insight and correlation on the fly, to be inserted into your own talk. That's why taking notes is always useful.